A progress report on a four-year-old, local initiative to prepare more youngsters for college success reveals encouraging results, though education leaders cautioned that California’s budget cuts threaten to curtail and reverse these gains. Four years ago, leaders from the Long Beach Unified School District, Long Beach City College and California State University, Long Beach signed The Long Beach College Promise, committing the three institutions to providing local students with greater opportunities to complete their higher education. The progress report highlights key steps that the three institutions are taking to prepare more students for success in college and in high-demand, high-paying jobs. Included in these efforts is a commitment to cover the cost of first-semester fees for every local high school graduate who enrolls directly at LBCC after graduation. The LBCC Foundation has raised more than $6.5 million and established an endowment to pay the enrollment fees in perpetuity. Thousands of students already have taken advantage of the tuition-free semester. The College Promise also guarantees LBUSD graduates admission to CSULB with minimum requirements. The latest report shows that 729 LBUSD students entered CSULB as freshmen in 2011 – more students than ever before and a 40 percent increase from 2008 when the College Promise began. • Nearly three of four LBUSD graduates (74 percent) are pursuing post-secondary education within one year of graduation. Half of those students are enrolled at CSULB or LBCC. • LBCC fall 2011 enrollment of LBUSD graduates increased to 1,675 despite funding cuts and reduced LBCC course offerings. • LBUSD students’ college readiness in English and math proficiency improved even as participation rates increased significantly. • While the number and proportion of CSULB freshmen from LBUSD has grown, the percentage requiring math and English remediation has decreased. • LBCC students from LBUSD continue to be much more likely to persist in college. LBUSD students’ persistence dramatically outpaces the persistence rate of students entering from other high schools. • Since the establishment of the College Promise, CSULB transfer students from LBCC are retaining at a higher rate than nonlocal community college transfers admitted with more rigorous criteria. Education leaders released the report during a news conference this week at Cabrillo High School in Long Beach. Officials at the news conference also awarded 27 scholarships ranging from $50 to $250 to LBUSD eighth graders who have shown academic improvement. California Community Colleges Chancellor Jack Scott also spoke at the event, calling the College Promise a statewide model of collaboration. 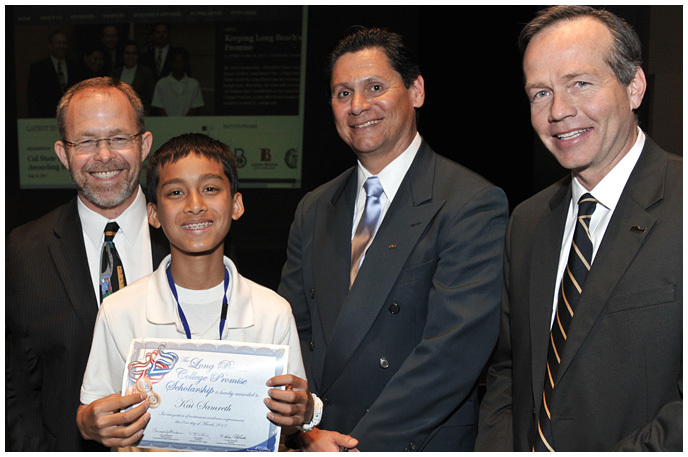 COLLEGE BOUND -- Butler Middle School eighth grader and scholarship recipient Kai Samreth accepts a College Promise scholarship from education leaders Christopher J. Steinhauser, Eloy Ortiz Oakley and F. King Alexander.